Mandurah Cruises are well known for their interesting, informative and most of all fun cruises and in order not to miss out on any of these, you will need to book for the Christmas in July cruises now. There will be three cruises on offer during July and all of them depart from Mandurah. Bring along your jumpers, Santa beards, elf ears and Christmas cheer, when you join Mandurah Cruises for their fun Christmas in July cruise. There is a fully licensed bar on board the boat and the feature of this cruise will be mulled wine, which you can drink as you enjoy the commentary! The cruise will take about 3 hours and there will be music to entertain you throughout this time. Here is a video clip showing a Christmas night time cruise and although it is a Christmas one, it is well worth watching as it will give you some idea of what the cruise entails. Bookings are essential and to make a booking, go to this site ‎or call 08 9581 1242. Another Christmas in July cruise will be held on Saturday 15th July, 2017. This cruise will meander along Mandurah's picturesque waterways/canals on board Mandurah Cruises function vessel, while you indulge in mouth-watering food which will be prepared by Mandurah's best chefs. Main course at Mandurah Quay, a fabulous place to dine! Catch 22 at Mandurah Ocean Marina for a scrumptious dessert and complimentary glass of sparkling, or beer on arrival. Mandurah Cruises jetty in front of the Mandurah Performing Arts Centre and finish at Catch 22 in the Mandurah Ocean Marina. If the adults only cruise does not appeal to you, you can always take their Family Christmas in July cruise. 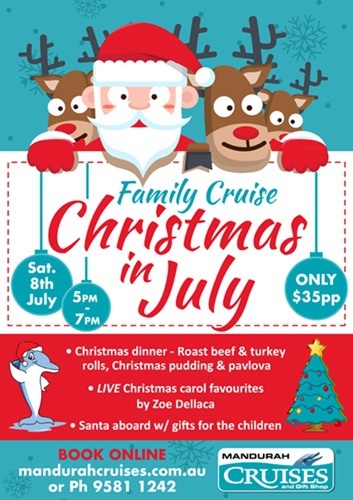 Join Mandurah Cruises for their Christmas in July Family Cruise which includes a delicious Christmas dinner, a visit from Santa for the children and live Christmas carols performed on board by singer, Zoe Dellaca. 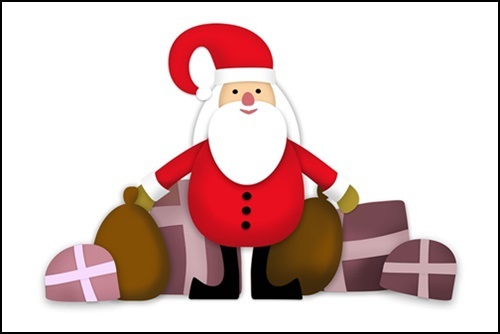 As a special delight for the children, Santa will be on board with a small gift for all the children! There will also be mulled wine, egg nog and kids' Christmas mocktails which will be available for purchase from the fully licensed bar on board, as well as other beverages including wine, champagne and spirits, beer, cider, non-alcoholic beverages and tea and coffee. Mandurah's number one tourist attraction has a cruise to suit everyone with dolphin and scenic canal cruises, a leisurely river lunch cruise taking in the interesting wetlands which have plenty of birdlife or a romantic evening cruise. They also do special functions where you can hire a boat for a party or wedding on the water - there's a cruise for everyone and every occasion! Situated just an hour south of Perth, all the cruising is done on Mandurah's protected inland waterways. Why not spend a weekend in Mandurah – there is heaps to see and do there and you can get reasonably priced accommodation, particularly at this time of year. For Christmas in July cruises, make sure you book now to avoid disappointment.